In a large oven-safe cast iron skillet over medium heat, cook the bacon until crisp. Remove, cool, and crumble. Carefully spoon away all but about 2 tablespoons of the bacon grease. Increase the heat to medium-high and add the Brussels sprouts to the hot pan. Cook, stirring infrequently to allow the sprouts to develop a dark brown color and begin to get crispy around the edges. Cook until nearly tender. Season with salt. Add the garlic. Cook 1 minute. Remove from the heat. 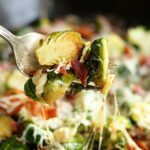 Pour the cream over the sprouts and sprinkle with the bacon and Italian cheese blend. Bake for 8 to 10 minutes or until the cheese has melted.